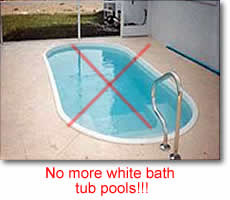 Most Fiberglass Pools that are installed do not have tile on them, that being said, does a fiberglass pool need waterline tile? As the sun beats down on the pool and the chemicals that are used in the pool, over time you will notice a faded line that appears. This line will be more noticeable when the water in the pool is low. Body oils, sun tan lotions, dirt and debris will float on the surface of the water and attach itself to the walls of the pool at the water line. This will give the appearance of a bath tub ring. The longer that this scum sits on the pool water the harder it will be to remove. Some stains can become permanent. This will become an ongoing maintenance item that can become very irritating. 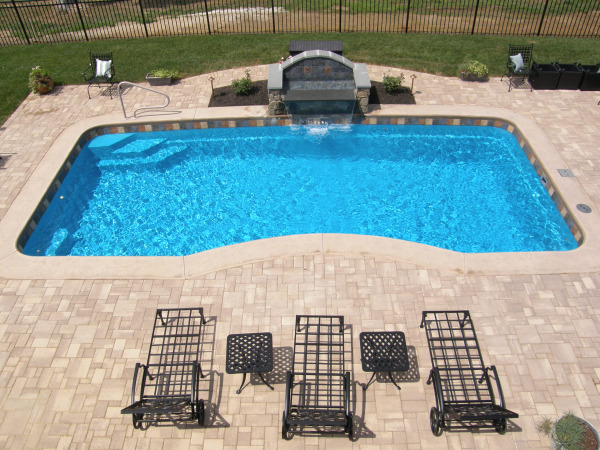 This pool looks GREAT with custom tile installed. You can really pesonalize your pool to your taste. The pool to the right has no tile and appears to be a bath tub. You may be asking yourself, "how do I get a pool with tile", Most Fiberglass Pool Manufactures offer their pools with many different tiles from the factory. The best way to have your pool tiled is on site. This way you can choose what type of tile you would like from numerous tile suppliers, whether it is a standard 6" x 6", Mosiac, glass, etc. If the pool is not level then the tile can be installed perfectly level before the deck is installed. Your pool can also be tiled after the pool has been installed, but the the quality of the job will always look better if it is installed at the time of installation.